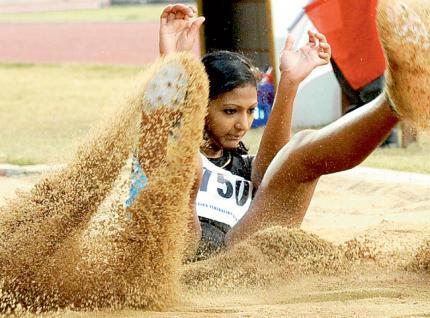 Lack of rest and crampy conditions could not tame down Nayana James as she cleared 5.86 m on the long jump pit, for gold, in the recently concluded National Junior Athletic meet in Ranchi . “I had set a target of nearly six metres. But weather conditions were bad and I was not able to perform to my optimum. We reached the venue a day before the event and did not get enough time to get acclimatised to the weather conditions,” she said. Nayana James, a native of Kozhikode, has already set	two meet records, one in last year’s State School Meet (5.86) and another in the National Junior meet held last year where she covered a distance of 5. 79 m.
“The Ranchi experience was a great one. I am happy that I was able to win the gold. The competition was tough and I was able to learn a lot of new things because of the exposure I got,” she said. Nayana, who is now training at Thalassery SAI Academy, is a product of Gramin Sports Academy in Chakkitapara, a rustic village in Kozhikode. “She needed to improve a lot. Though she won the gold, it is not her best performance. However, I have total belief in her and I know she will become an athlete to reckon with in a few years,” said Jose Mathew, Nayana’s coach in SAI. Jose Mathew was also coach to Mayookha Johny at the centre. “Nayana has a bright future and she will become a good athlete in the future. After Mayookha and Prajusha, we can count on these bright kids. They will be the future of Kerala athletics,” he said. However, Jose maintained that it was too early to judge the player. “This is an athlete’s grooming age and we have to wait a few more years to get the maximum output from an athlete. Most players perform at their peak when they are 15-16 and then just fade away. We need to improve our results each year,” he pointed out. “Nayana’s main advantage is that she has a good physique for a long jumper. She has the talent and speed. But we have to wait a little more. I am hopeful that she will become one of the best in the senior’s level too,” Jose said.